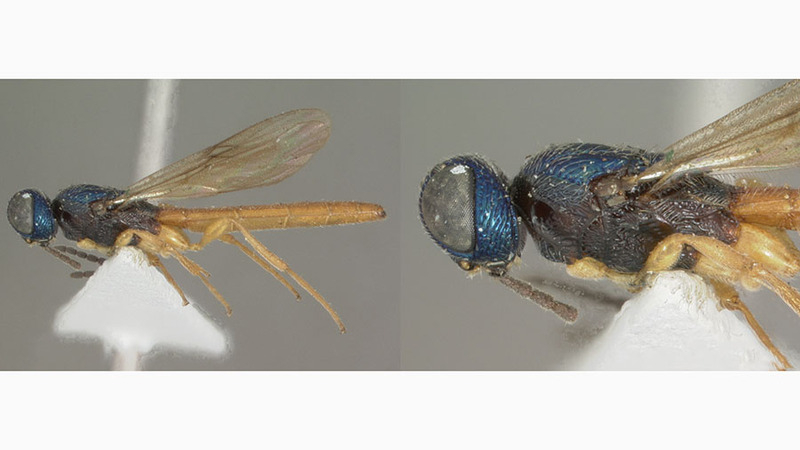 As many as twenty-one species of parasitoid wasps are described as new to science, following the first ever revision of their genus since its establishment back in 1893. The study simultaneously updates the count of species within the genus (Chromoteleia) to 27 in total, produces a systematic revision of the world’s representatives of this group of wasps, expands their biogeographic knowledge, and clarifies their generic concept. The monograph is published in the open access journal ZooKeys by a team of US and Canadian scientists, led by Hua-yan Chen, graduate student at the Ohio State University. The wasps in the genus Chromoteleia are easily distinguished thanks to their large size in combination with their vivid colouration. Compared to other species in the family of platygastrid wasps, which normally measure merely 1 – 2 mm in length, the species in the studied genus range between 3 and 9 mm. Their uncommonly large, robust and elongated bodies is why the scientists assume that these wasps likely parasitise the eggs of orthopterans, such as grasshoppers, crickets and katydids. A focal point in the study is the intriguing distribution of the wasps. While the genus is widespread throughout continental Mesoamerica, Central America and South America, and its distribution ranges from the Mexican state of Jalisco in the north all the way to Itapúa Department in Paraguay and Paraná in southern Brazil, the species C. congoana is a lone representative of the genus in Africa. The ‘lone’ African representative of the genus, Chromoteleia congoana. While dispersal from South America to Africa has been observed in the past in another genus of parasitoid wasps (Kapala), the scientists are not willing to reject the possibility of Chromoteleia wasps having been widely distributed across the Old World during a previous geological epoch. Such phenomenon, also known as a relict population, would not mean that the wasp group has subsequently ‘conquered’ the Neotropics and current species inhabiting the New World are rather remainders of once widespread insects. To conclude their findings, the scientists examined specimens hosted in collections at twenty natural history institutions from around the globe, including the American Entomological Institute; American Museum of Natural History; Bernice P. Bishop Museum; California Academy of Sciences; Canadian National Collection of Insects; California State Collection of Arthropods; Florida State Collection of Arthropods; Instituto Alexander von Humboldt; Illinois Natural History Survey; Kansas University’s Natural History Museum; Museo del Instituto de Museo del Instituto de Zoologia Agricola; Museum National d’Histoire Naturelle; Museu Paraense Emílio Goeldi; Lund Museum of Zoology at Lund University; Triplehorn Insect Collection at the Ohio State University; South African Museum; Texas A&M University’s Insect Collection; Bohart Museum of Entomology; University of Colorado; and Smithsonian National Museum of Natural History.